LATEST BLUETOOTH V4.2+EDR TECHNOLOGY: Headphones are connected with devices synchronously and wireless with great quality of stereo sounds by fantastic TWS (True Wireless) technology. Premium sound with deep bass and crystal clear treble ensure perfect listening experience. 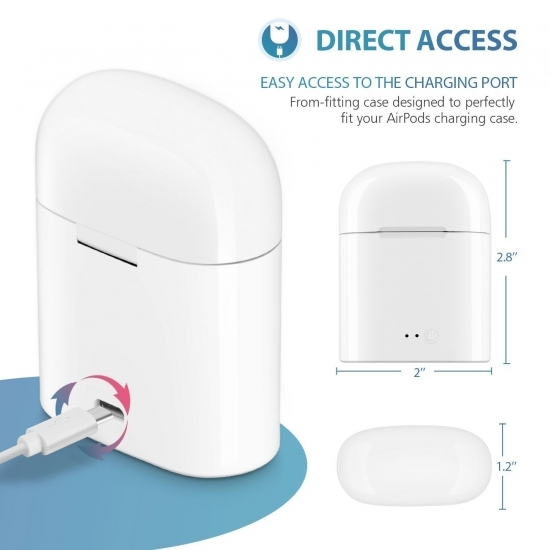 QUICK CHARGE WITH UNIQUE CHARGING BOX: Portable charging case is ultra-lightweight with large capacity Lithium batteries, which can support 2-4 time fully charging for the wireless earbuds and let you enjoy more than 5-6 hours continuous music or talking time after each single charge. Only takes 1.5 hours to fully charged. Never worry about low battery when you are out all day. SUPER LIGHT-WEIGHT DESIGN & SWEATPROOF: Super lightweight and the stabilizer design according to ear geometry to ensure secure, comfortable fit for any ear. Anti-sweating material keeps the in-ear bluetooth earphones fully function even when dripping with sweat, offers sweat-resistant protection while running, biking, training, jogging, hiking, exercising. 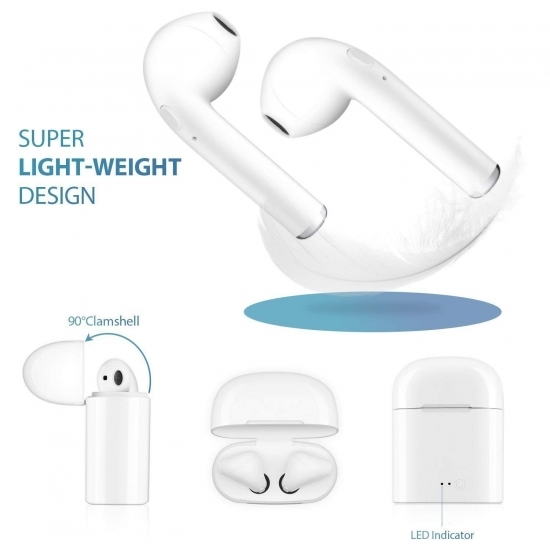 STRONG SIGNAL: This bluetooth headphones built-in Mic, great for hands-free calling, listening to music, ,games,news, etc., connect seamlessly with all enabled devices up to 30 feet away. 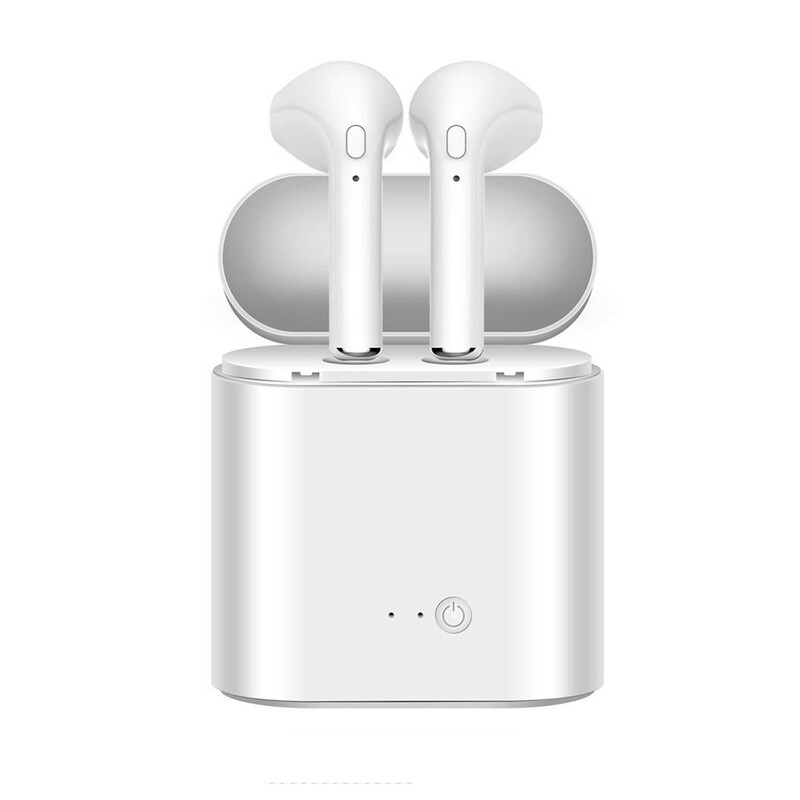 COMPATIBILITY: Work with all Bluetooth enabled mobile devices including phones such as iPhone X / 8 / 8 Plus / 7 / 7 Plus/6/6 Plus, Samsung Galaxy S9/S9 Plus /S8 /S8 PLUS , and tablets sucha as iPads. Pairing and connecting only takes a few seconds. 7.Battery capacity: Internal 65mah rechargeable Li-ion battery. 8.Sweat proof: Sweat proof material of shell to ensure high quality sound when sports use. 9.Compatible with Apple iPhone 6/6S/7/7 plus/8/X, Samsung S8 / S8 plus / S9 / s9 Plus/ S7 / S7 edge /note 8 / ipad, notebook, Android, etc. 3. Turn on the Bluetooth on your device and search "tws-I7" to connect.When the led flash slowly in blue,they pair successfully. 2. Please turn on the “Bluetooth” on your cellphone and choose “i7 -tws ” on your list, there would be reminding voice from the earphone saying “pairing success”.